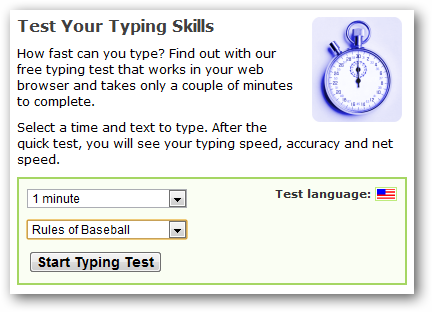 Test your touch-typing level to see how you are doing in terms of typing speed and accuracy. This site allows you to choose from the default text or BBC News which includes technology, sports, entertainment, health, and business news. 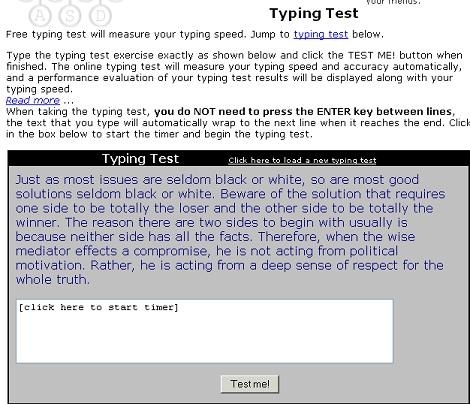 This site lets you set the language, the duration of the test, and the subject which includes: astronauts, Aesop's fables, rules of baseball, Tigers in the Wild, The Wonderful Wizard of Oz, Zebra - Africa's striped horse, the Enchanted Typewriter, Test Instructions.